Mendax! or Liar! in English is an engaging Latin card game that teaches students how to conjugate and translate Latin verbs fluently in the present active tense in all four conjugations. Two of the four decks feature present tense Latin verbs forms that the student must translate while playing the game. 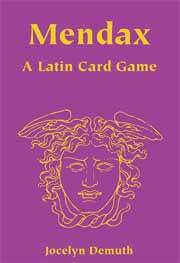 The other two decks feature present tense English verb forms that the student must know in Latin in order to play the game. The rules are simple and resemble rules for card games many students already know. The game is appropriate for students in grades 6-12.
similar to the English card game, B.S.